FC Barcelona has emerged as surprise contenders to bring Swansea shot stopper Michel Vorm to the Nou Camp, according to the Daily Star. With long serving Victor Valdes refusing to sign a new contract with the La Liga champions elect, the Spanish giants have reportedly turned to the 29 year old Vorm as a potential replacement. The Daily Star point to the Dutchman’s ability with his feet as one of the main reasons for Barcelona’s interest, as they expect even their goalkeepers to be able to fit into their passing style of play. 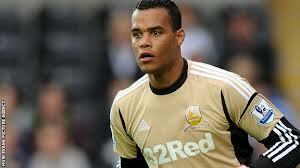 Vorm has gained many admirers since his move to the Premier League in August 2011 with Liverpool also rumoured to be interested in his services. Swansea, the recent Capital Cup winners, will try to resist all advances for their number one, but will no doubt be aware that the lure of Barcelona would be very hard for any player to ignore. Could Montoya be a part of Barca’s defence for years to come? I hope Barcelona do get him, Liverpool don’t need anymore of Rodgers’ mates from Swansea.